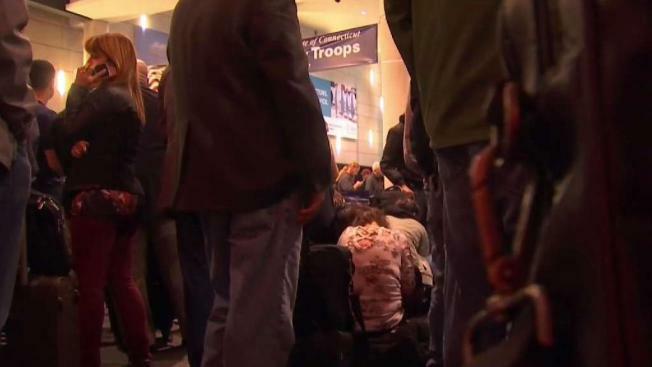 A crowd of people could be seen standing in the dark near the TSA checkpoint around 4 a.m. Passengers at Bradley Airport waited hours after multiple power outages at the airport on Monday morning. The lights are back on at Bradley International Airport and TSA screening has resumed after a power problem caused multiple outages on Monday morning. Authorities at the airport in Connecticut said it experienced a power loss from its main source of power. Terminal A had been operating on backup power, the airport said. Some areas were operating with lights and others were not. Airport officials are working with Eversource to determine the cause of the power loss. The power problems impacted the airport's TSA screening area and no screening was taking place for hours. A crowd of people could be seen standing in the dark near the TSA checkpoint around 4 a.m. Some lights flickered back on around 4:45 a.m. before fully returning around 5 a.m.
Around 5:20 a.m., the lights went out again. Power was restored around 6 a.m. before going out again around four minutes later. Officials restored power again shortly after. Hundreds of people were stranded in the terminals waiting to get their tickets and go through TSA. Passengers were allowed to enter the TSA checkpoint around 7:30 a.m.
More than 20 flights are delayed because of the power problems. Inbound roadway access to the airport was temporarily closed, but has since reopened. If you are scheduled to fly this morning, you're urged to contact your airline to find out the status of your flight.